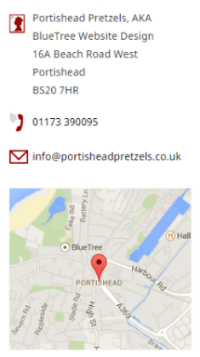 Whilst looking for an example to show a possible new customer, I noticed one client’s website was missing the company name and address. You guessed it: NAT – Name, Address, Telephone number. Or NAP if you drop the “Tele”. AKA Business Information. Moreover, it’s very easy to do with BlueTree CMS – and to protect that important data from web crawlers that generate spam. BlueTree CMS has a spider-proof, “Business Information Block” feature that handles your name, address, and phone number. Get this right at the start and you won’t find that, later on, you have a big review exercise that you’ll never start because it’s too big and too boring. You may not be too worried now, but at some time you’ll see competitors above you in search results. If you don’t get all this right, search engines may penalise your website, or maybe not display it at all. Whilst it’s largely irritating, not dangerous, spam is a big time-waster. Worst case, someone may use it to steal your business identity. Don’t just type your Business Information into your web pages. Make sure your CMS protects it from “spiders”, the computer programs hackers write to crawl the web and collect such information. First enter your NAT, just once, in the Sitewide Settings panel. on a separate line, just like that, with no other characters. 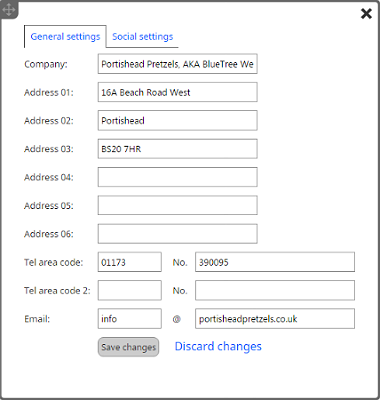 And, anywhere on your website, even within a paragraph, if you type that same telephone number with no spaces, BlueTree CMS will convert it to a clickable link, hidden from web crawlers. It will do the same with your email address. Disclaimer: We are not lawyers. We offer the information on this page in good faith but please don’t rely on it. Take legal advice. Registered businesses must display more than this basic information. The requirement for partnerships is different from that for limited companies, for example. Search for a phrase containing your registration type, e.g. The “site:gov.uk” parameter will ensure you see results from the UK Government (apart from the ads), just to be on the safe side. If you omit it you’ll see results from solicitor websites, too, which is fine but maybe not definitive. Often forgotten, your domain registrar holds a copy of your Business Information. Check yours by typing your web address into this page at whois.com. The registrant (hopefully you) is able to change this if it’s wrong. This is the subject of our second post in this series. If you’d like a notification when it’s published, please sign up using the “Find this useful?” button, bottom right. This entry was posted in Client websites, Digital Marketing and tagged anti-spam, CMS, content management system, SEO guidelines on February 15, 2017 by Dave Fielden. With a steadily growing user base, it seems like a good time to talk about why BlueTree developed its own Content Management System, or CMS. The primary reason: we can no longer use our favourite CMS, Adobe® Contribute®. Adobe now has a new business model, with high monthly fees, aimed at big corporates. You can still buy Contribute, but it’s no longer being developed. We have to find a solution for existing clients, and we can’t recommend obsolete software new ones. There are plenty of good CMS’s around,” says Mark, “many of them free. We’ve used quite a few, including one of the most popular, for years, on behalf of our clients. However, it’s become clear that there is a gap in the market. Many small business owners want to write and maintain their own website content, but lose patience due to the technical demands of their CMS. It’s not that small business owners aren’t capable of doing it; many do so with great success. It’s more that there’s so much to learn – most simply do not have the time. Starting a new business or growing a small enterprise is demanding enough on its own. In building these systems, we’ve had to write hundreds of “components”, small parcels of Internet code, from which we built each one. Think of them as Lego bricks, each with its own particular function. We clip them together to make the CMS. They have one big advantage over Lego, however: we can copy them; we don’t have to break up one model to make the next. So, why not fill that gap in the market, and use our components to build our own, simple CMS, one that a time-strapped small business owner can actually use? So, what would we need to provide for our target customers? Remember, they’re entrepreneurs. They know all about their field, they’re very skilled, dedicated, and highly motivated. Often they know less about the Internet, and how to use it for sales and marketing. And they’re very short of time. There’s no way a piece of software can do all this, so we need more. BlueTree CMS is a complete package, which includes all the service and software you need to start and continue your Digital Marketing journey. Fully supported: a skilled web-master on call should you ever get stuck. There are other features that people new to Digital Marketing perhaps don’t know they need. A first website is often simply an on-line brochure. However, you quickly realize your website is a business asset that can save costs and deliver revenue, generate sales and engage with customers. Web page rename function, with automatic redirects so you don’t duplicate content. What other website features, design and commercial, would our customers require? Staged payments: only pay for each stage when you’re happy. Naturally, we can’t afford to do this out of the goodness of our hearts: it must be commercially viable. In essence, it must allow us to give great service to our customers – they pay our wages. It must never get too complex, but it must continue to improve in other ways, particularly, ease of use, and cost to support. Simplicity: easy to use, so we must provide a way forward for those who outgrow it. We’re now well on the way and we have our first batch of clients, with more in progress. If you’d like to join them, or just find out a bit more, please go to our contact page or click that “Get in Touch” button, to the lower right of your screen. This entry was posted in Website design and usability and tagged BlueTree, CMS, content management system on June 12, 2015 by Dave Fielden.